London 19th March 2019: Foehn, the developer of cloud communications, today launched their new cloud contact centre platform, VoxivoCX. This marks the second release from Foehn’s Voxivo platform following the launch of Voxivo Cloud Phone System in 2017. The new cloud contact centre incorporates the ground-breaking simplicity, intuitive operation and ease of management featured throughout the Voxivo suite, all hall-marks of Foehn’s design philosophy. Importantly, the feature-set has been based on a thorough appraisal of requirements taken from market research and feedback from Foehn’s SME customer base where contact centre managers are calling for improved agent productivity and reductions in the time and costs incurred on implementation. More rapid user adoption, intuitive controls for operation and stronger user engagement are considered key factors for improving value over the lifetime of the system. VoxivoCX delivers features designed around the specific needs of contact centre administrators and supervisors as well as agents. These include real-time monitoring of agents and calls, assignment of rules and skills levels, control of queues and IVR, plus management of extensions and users for optimisation of productivity. Notably, a dedicated interface gives agents intuitive control of a complete tool-set, enabling an agile response during customer engagement. Wallboards and CRM integrations provide insights that drive performance whilst recording, monitoring, whisper, and barge help supervisors support agents and improve their performance. 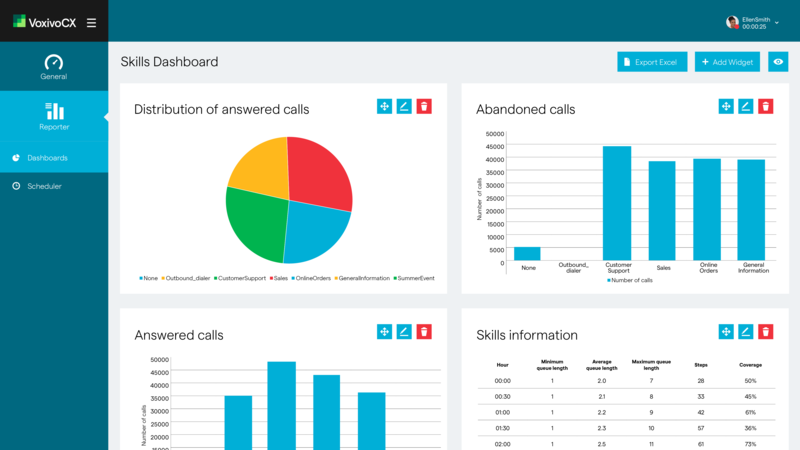 Importantly, supervisors gain critical contact centre insights from analytics, including live performance monitoring, multiple dashboards, wallboards and powerful reporting. An innovative reporting module provides comparison of data across both queues and agents. Pre-built dashboards show key metrics whilst additional, bespoke charts, graphs and tables can be created simply using an extensive choice of graphical ‘widgets'. A common objective for contact centre managers is to focus on improving first contact resolution. With skills-based routing, companies can ensure every customer gets to speak to the right agents with the right skill, increasing the probability of first contact resolution. Offering configurable ACD routing, real-time reporting, customisable agent desktops and self-service IVR, VoxivoCX makes life easier for both the supervisor and the agent. Supported by Foehn’s Professional Services team, the platform is fully configurable to business needs and simple to deploy, often within 24 hours. Deployment services include Foehn’s own cloud hosting, number porting, SIP trunking and Internet access via leased line or business grade broadband. With skills-based routing, you can ensure every customer gets to speak to the right agents with the right skill. Increasing the probability of first call resolution. Help your supervisors support agents with the right tools including recording, monitor, whisper, and barge. 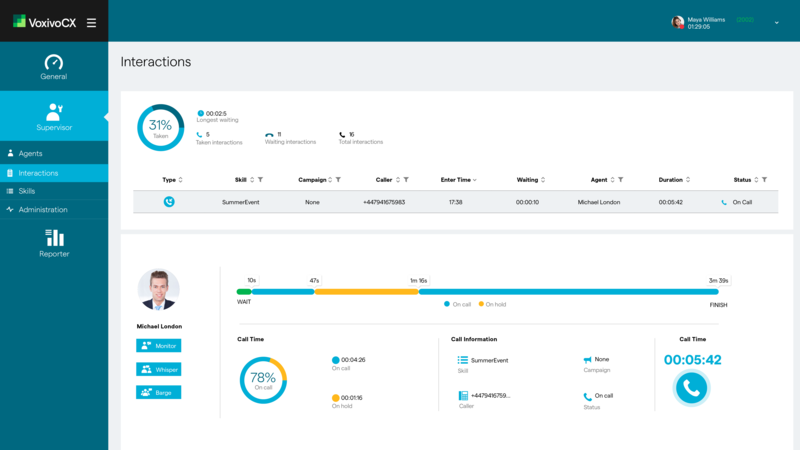 Gain critical contact centre insights from analytics, including live performance monitoring, multiple dashboards, wallboards and powerful reporting. Foehn provides cloud communications products, delivering contact centres and unified communications to the private and public sectors. We continually challenge ourselves to solve problems and build better cloud communications to help you work smarter. By combining our own technology, with uncompromising design principles and the power of open source, we can deliver truly intuitive communications products. This is how we make the complex simple. Regardless of your needs, our experienced team can help reduce the challenges and costs of moving to a new generation of cloud communications products. We are the ITSPA Best VoIP Software Winner 2018 with customers spanning every sector. We have also won awards for our contact centre implementations as the Genesys PureCloud partner of the Year. This press release was distributed by ResponseSource Press Release Wire on behalf of Kanehythe in the following categories: Business & Finance, Public Sector, Third Sector & Legal, Computing & Telecoms, for more information visit https://pressreleasewire.responsesource.com/about.